At the weekly level, short track stock car racing has long been focused on family and friends. With the 8th running of Brockville Ontario Speedway’s 1000 Islands RV DIRTcar Northeast Fall Nationals less than a month away, the thought of a Saturday night regular taking the checkered flag is a distinct possibility. 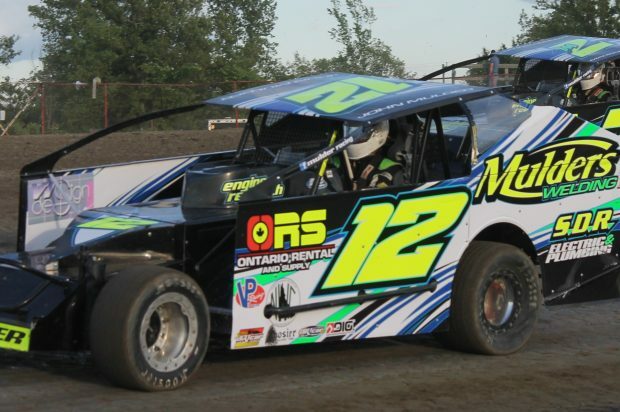 Car counts in the Small Block and Sportsman Modified divisions at The BOS have been strong for a number of years and several of the drivers in each class are members of racing families. 13-time track champion Danny O’Brien – who competes in the 358 Modified field with his older brother Pat and younger sibling Tim – followed in the footsteps of his father, Pat O’Brien Sr. Stephane Lafrance added an extra digit to the #15 made famous over the years by his father Marcel and made his own mark in the sport with his craft-built, limited edition racecars. After practicing his craft at a number of different tracks in past campaigns, Matt Billings – a former go kart racer – returned home this year and logged a pair of main event wins, while finishing 7th in points. Chris Herbison – a former Sportsman division champion – developed a passion for the sport from watching his father George compete and this year, his son Jarrett – who also graduated from the karting ranks – finished 16th during his rookie Sportsman-Modified season. The Brockville hometown attitude continues with the Evoy clan and 2016 Sportsman division track champion Dylan – whose race shop is about a 10-minute drive from the speedway – and even extends to nearby Spencerville, with the father and son duo of John and Madison Mulder, who finished 10th and 12th respectively in the recently concluded Small Block Modified standings. For the 8th annual edition of the 1000 Islands RV Northeast Fall Nationals – A Craig Revelle Tribute, presented by St. Lawrence Radiology, Rez-X Racing and sponsored by 103.7 BOB-FM, the Brockville Recorder & Times and CKWS-TV – the Friday, October 14th program has the final Mr. DIRTcar championship event for the 358 Modifieds, Late Models and Street Stocks, with a 7:00 green flag. The Saturday, October 15th agenda is headlined by DIRTcar Big Block Mods, the championship final for Sportsman Modifieds, Mini Stocks and Outlaw Vintage Mods. Racing gets underway at 4:00. Fans can find complete Northeast Fall Nationals details by checking www.brockvillespeedway.com, as well as the track’s Facebook page and Twitter feed. Stephane Lafrance (#115) wheeled his latest home-built 358 Modified creation to a feature event win and 13th place in the final 2016 point standings at Brockville Ontario Speedway. Coming ‘home’ for the first time in a couple of years, Brockville’s Matt Billings (#74) logged a pair of feature wins and a 7th place finish in the Small Block Modified standings at Brockville Speedway. With a pair of Fall Nationals Sportsman Modified wins on his resume, Chris Herbison (#63) wheeled his 358 Mod to a feature win and coached his son Jarrett to a 16th place finish in his rookie Sportsman campaign at Brockville Speedway. The father and son duo of John (#12) and Madison Mulder (#7M) showed their stuff during 2016 Small Block Modified action at The BOS.